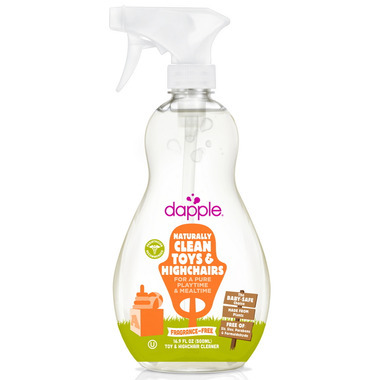 Dapple Fragrance-Free Naturally Clean Toys & Highchairs makes for a pure playtime and mealtime. Dinnertime, playtime, naptime…no time left to clean? No problem. Ingredients: Water, cocamidopropyl pg-dimonium chloride phosphate (cleaning agent derived from coconut oil), glycerin (solvent derived from plants), gluconolactone & sodium benzoate (preservative derived from plants), sodium citrate (ph adjuster derived from fruit), sodium bicarbonate(natural cleaner derived from minerals). Does the job with none of the typical nasty ingredients. Peace of mind and a quick and easy clean-up. Unscented, but it takes me a while to wipe the soap away. I've been using this brand for years and I will continue using it many more years to come. I love that this product has no scent and price is pretty reasonable. Highly recommended. Love this! It's nice and quick clean after a messy meal or end of day. I have confidence in knowing it's safe for my daughters. I was skeptical to purchase this. I use the bottle dish soap and like it so I decided to give this is try. I was so pleasently surprised at how easy the grime comes off the highchair. Honestly it's so much easier than grabbing soap on a cloth. I still disinfect the highchair and tray nightly but througout the day I just use this and love it. I will repurchase. Works well, and safe for babies! This product does the job but it does have a fairly strong smell in my opinion. I'm still happy to use it but the odor took me by surprise. i feel safe using this on my babies toys and high chair. It doesn't leave anything sticky behind, has a sublet (but nice!) scent, and I love that it's a natural product. I found this product to be very handy! It is not sticky and doesn't leave residue. It is comforting to be able to wash a toy or high chair and not have to worry about harsh chemicals being left behind. I would definitely recommend this product to those of us that prefer a green&natural home.